TAIPEI (Reuters) – Taiwan’s opposition leader and presidential frontrunner said she would not provoke China when seeking ways to engage with the island’s giant neighbour. Tsai and two rivals for the presidency were giving their third and final policy statements a week before Taiwan votes for a new president and parliament on Jan. 16. She has trodden carefully in discussing how she will engage China if, as expected, the DPP wins power. The party has historically favoured the island’s formal independence and says it believes only Taiwan’s people can decide its future. Beijing, which has never renounced the use of force to bring what it deems a renegade province under its control, takes this to mean the DPP wants formal independence from China. It will be watching the election outcome closely. Defeated Nationalist forces fled to Taiwan after losing the Chinese civil war with the Communists in 1949. Relations have improved rapidly since Ma Ying-jeou of the Nationalist party became Taiwan president in 2008, and the two sides have signed a series of landmark trade and tourism deals. Tsai said the DPP advocates “active diplomacy” and will seek greater cooperation with other countries. Taiwan’s diplomacy cannot rely on China’s goodwill, she said. 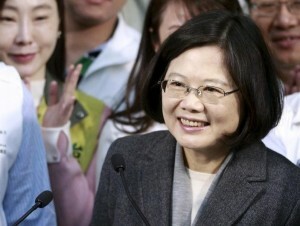 Tsai is one of three presidential contenders, which also include Eric Chu, chairman of the ruling Nationalist party, and James Soong, chairman of the People First Party. Taiwan is set to surge over the hump of its 35-year voyage from a military-ruled, one-party state, to one of the most successful and vibrant democracies in Asia.